You too can make Creme Brulee at home – it’s super easy! My husband’s #1 favourite dessert has always been Creme Brulee, and a couple of years ago after being together for almost a decade I decided to teach myself how to make it for him as a birthday surprise. And it’s REALLY simple actually!!! With just 4 ingredients, and a bit of patience, you too can be enjoying this overpriced restaurant dessert at home. Don’t be daunted… it’s super easy to make! 1. You need to buy yourself a good Brulee Torch. Yes, you can technically use a normal everyday blowtorch I suppose, however… you need a very, very delicate hand. A better idea is to invest in a kitchen-friendly torch that you can actually store in one of your kitchen drawers. We picked up a Fox-Run torch from a local kitchen store for about $30. They run on butane by the way, so don’t forget to pick some of that up too as they do not come pre-filled and ready to go. AND… PLEASE READ YOUR TORCH AND BUTANE INSTRUCTIONS CAREFULLY BEFORE USING. 2. 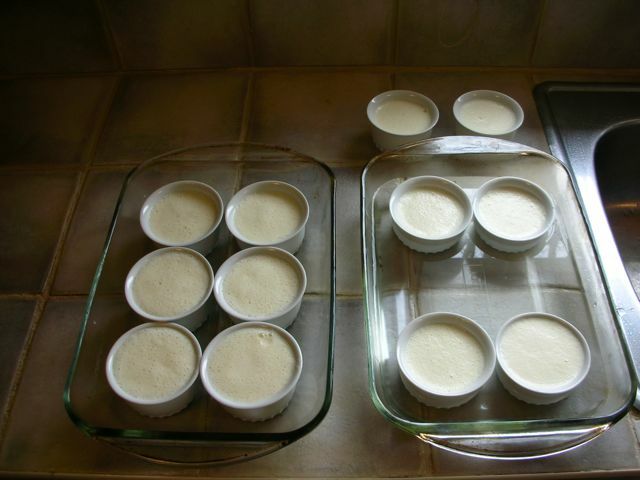 You will also need ramekins (see below). You can usually pick up a basic set of 12 for under $20. OR you can opt for the fancier, restaurant-style, shallow ramekin (not shown) which can run you about $3 each. 1. Preheat your oven to 325 degrees F.
2. 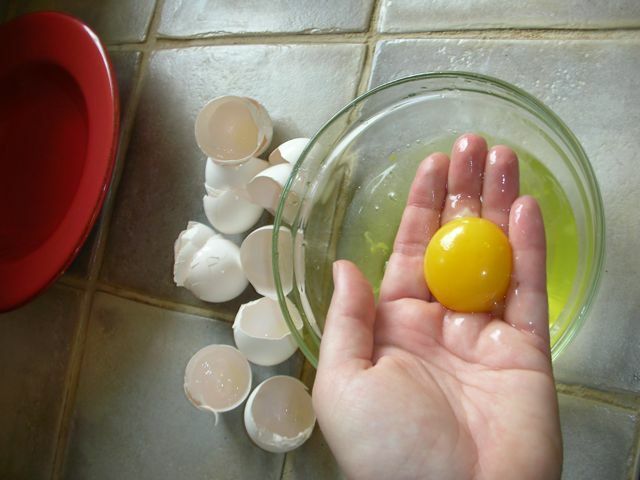 Carefully separate egg yolks from their whites using either an egg separator, or your hand. PLANNING TIP: Hubby’s 2nd favourite dessert is Lemon Meringue Pie, so I always plan to make it the next day so that I can use up the leftover egg whites – waste not, want not! 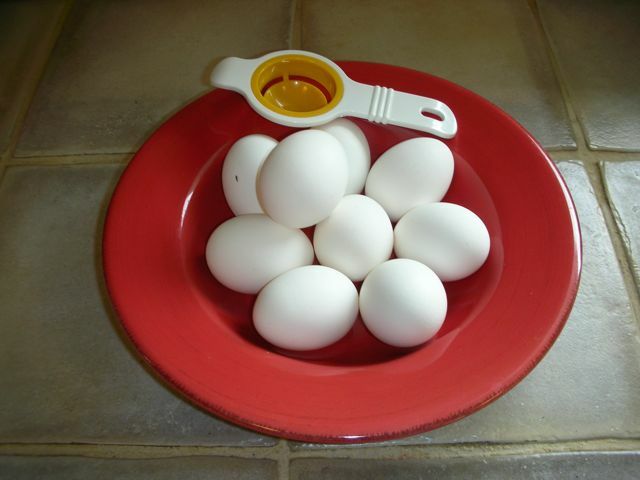 Place your leftover egg whites in a sealed container in the fridge for tomorrow’s healthier egg-white omelets, or for any type of meringue project. 3. 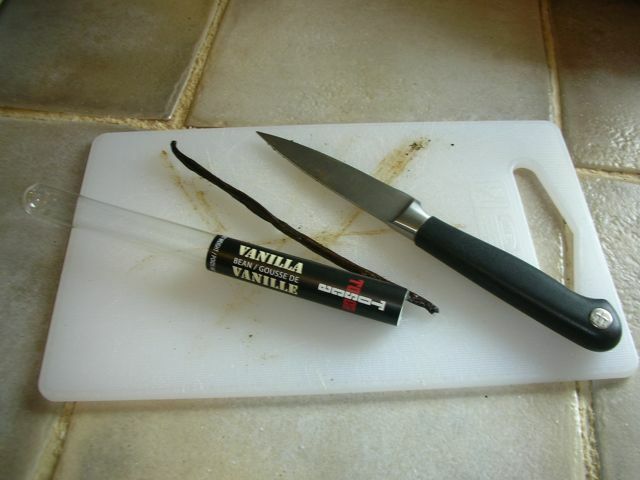 Using a paring knife, split your vanilla bean down the middle length-wise, scraping out the seeds with the back of your knife. BY-PRODUCT BONUS: If you also cut your leftover vanilla bean in half width-wise you can then add it to a bottle of vodka. Shake the mixture daily for a week, and leave it at room temperature to infuse the alcohol and make homemade vanilla vodka. I love using this for making my chocolate-martinis! 4. 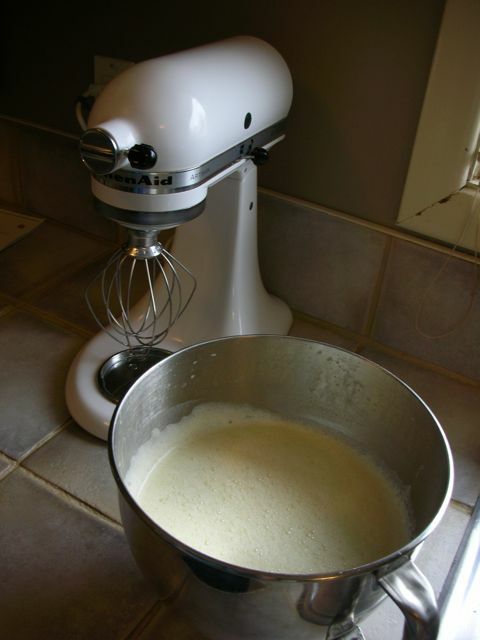 Pour your whipping cream into a medium-sized saucepan over medium heat, and add your vanilla bean scrapings, whisking often. 5. 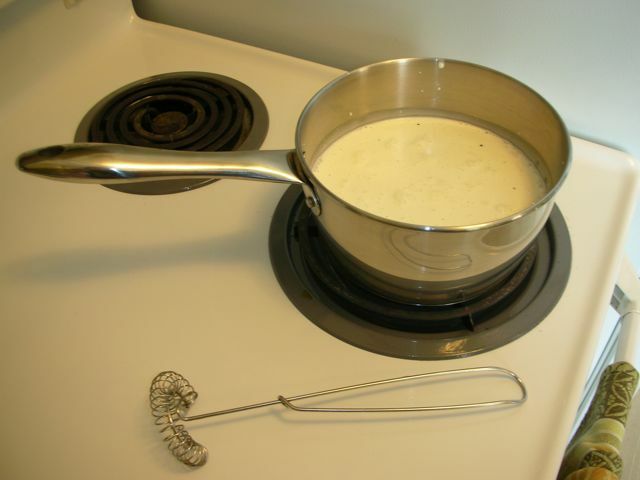 Bring cream to a brief simmer, but do not boil the cream or it will overflow and make a mess of your stove-top. 6. 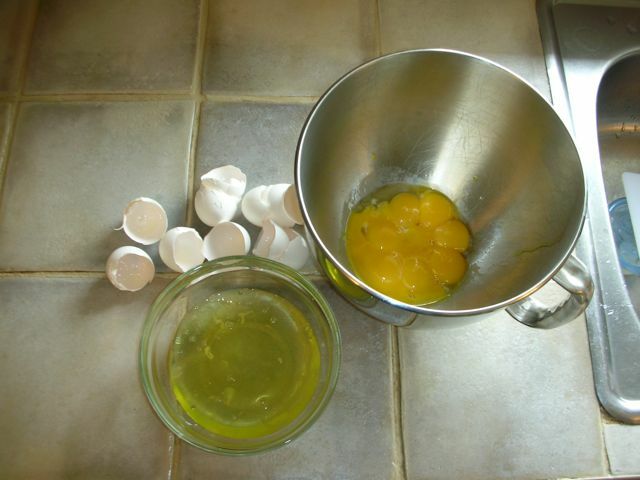 While your cream is heating, use your mixer and a large bowl to cream together the 9 egg yolks and 3/4 cup superfine sugar until the mixture is pale yellow and thick. 7. Remove your saucepan from the heat when the liquid is hot to your fingertip touch. 8. 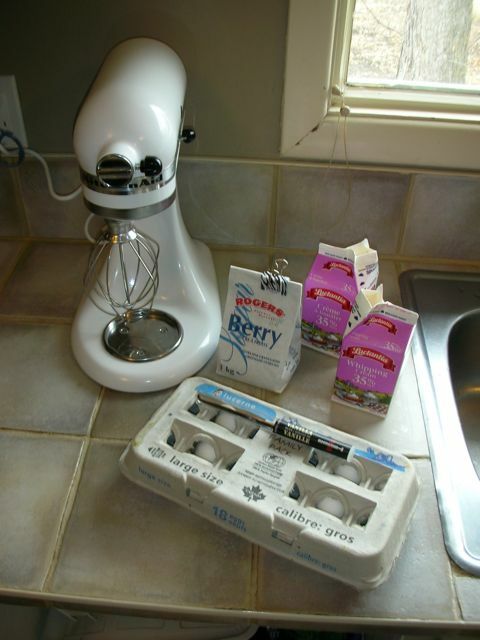 Very gradually add the hot vanilla cream into your yolk and sugar mixture on a low-speed setting or while also using a whisk. NOTE: Do not add your hot cream too quickly, or the eggs will cook and you’ll have to start again. Slow & steady wins the race! 9. Spoon the custard into clean, dry ramekins. I like to fill each ramekin to just below the top rim as they do shrink down about a 1/2 inch. 10. 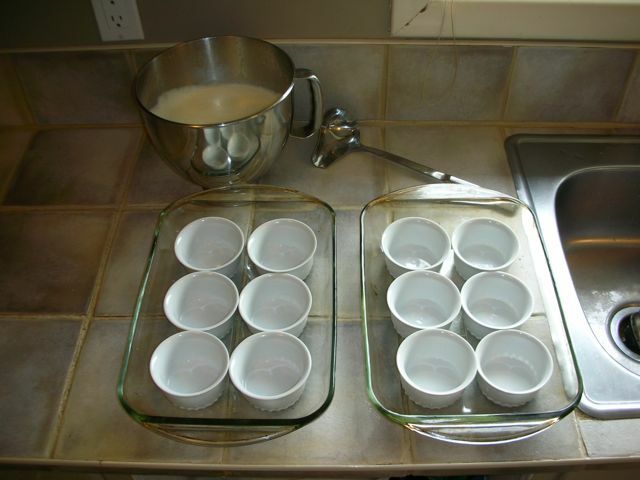 To make a water bath, place ramekins in a roasting pan or 9×13 baking dish, and fill the pan with enough warm water to come halfway up the sides of the ramekins. 11. Bake uncovered for about 35 to 40 minutes (depending on your oven) until the custard is barely set around the edges – it should still have a tiny bit of jiggle. NOTE: You may want to cover the pan loosely with foil to prevent over-browning either right from the start or about halfway through. 12. 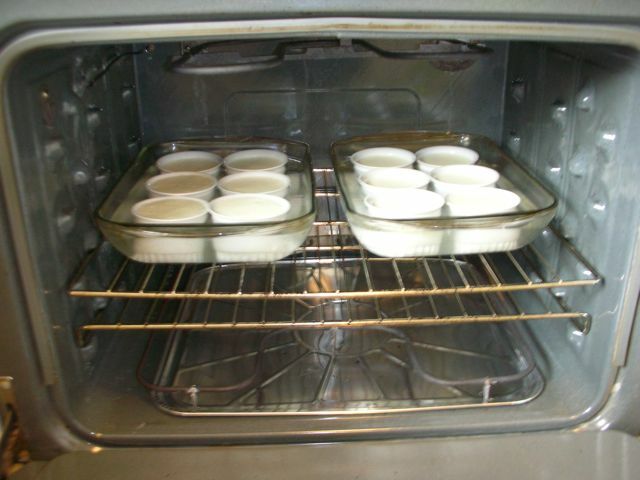 Remove pans from the oven, and then remove each ramekin from its’ water bath. Cool to room temperature, about an hour. 13. Transfer all of the ramekins to your refrigerator, and chill for at least 2 hours. 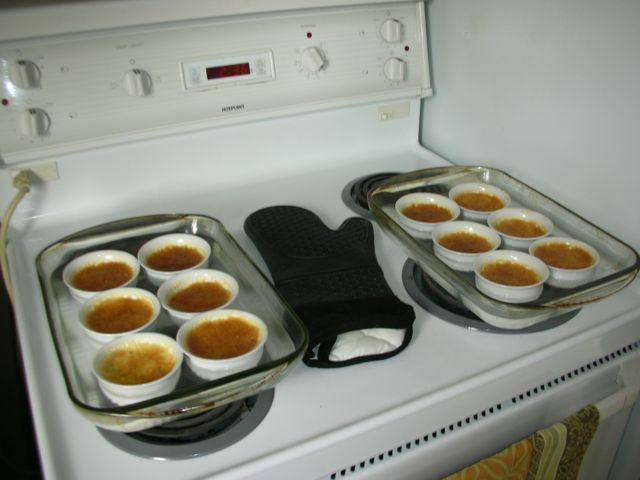 And I’ve even kept Creme Brulee in the fridge up to 4 days uncovered, because there is no way that Jeff and I can eat 12 Creme Brulees in one day! Though Jeff would love to try I’m sure. TIP: Our torch likes to sit and rest for about 30 minutes after it’s filled, so plan ahead when you’re ready to fire it up. 14. 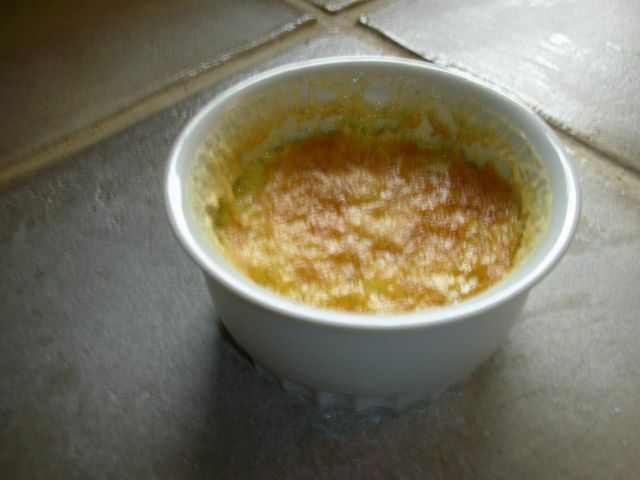 To Brulee: Sprinkle 1 tablespoon of the superfine sugar into each chilled ramekin, ensuring that it is evenly spread over the custard. 15. Hold your torch slightly above the sugary surface to gently brown the sugar. With patience it will form a nice even, lightly-browned crust. 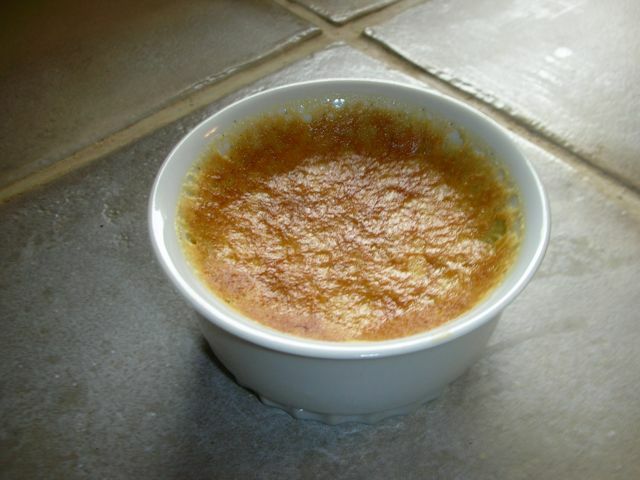 JEFF’S TIP: My hubby is best at doing the brulee work actually, and he suggests moving the flame in a circular motion around the inside edges of the ramekin and then back and forth through the middle so that the crust is evenly caramelized. This may take a little practice to get it just right… just remember you need to MELT the sugar, without burning it. 16. 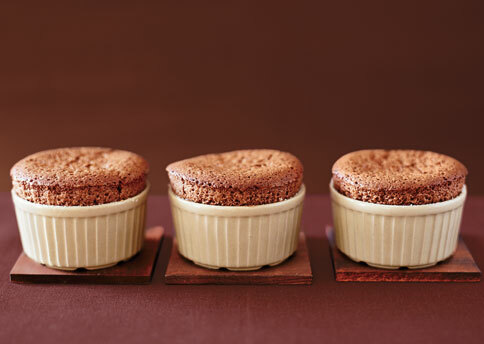 Allow each ramekin to cool slightly, but serve the dessert at once. I like to include some fresh raspberries on the side. First let me reiterate that I am not a professionally-trained chef, nor do I attest to being an accomplished pastry chef. I’m just a very “curious cook” who enjoys trying new culinary adventures. Can you use vanilla extract? Yup probably. The classic Creme Brulee only uses vanilla for flavouring, so I usually try to hunt down a REAL Vanilla Bean. Thankfully they are getting easier and easier to find at your local grocery store these days for about $6 for two beans. Do you need to use such a high-fat dairy product to make Creme Brulee? Honestly, I’ve always assumed that heavy cream in a recipe means 35% whipping cream. But I’m sure that you could use Half & Half, or a lower fat product. However it IS dessert, and it’s not like you’re making this every day or every week. So in our household – it’s a calorie splurge. Enjoy! – Liqueurs such as Frangelico or Grand Marnier by simply ‘spiking’ half the batch with an ounce or two. Plus I have tried Chai Creme Brulee too during my chai-obsessed phase at some restaurant and it was yummy too. There is also Ginger, Green Tea, Cinnamon, Coffee, Maple, Lime, etc. etc. etc. – go ahead and use your imagination and your favourite flavour(s)! Please let me know what variations you’ve tried by sharing them in the Comments section below! courtesy of Ciao! Magazine’s article on Pastry Chef Richard Warren of Winnipeg’s Fort Garry Hotel. Hopefully mine come out as nice as these… fingers crossed – we shall see!